Awareness ribbon ring. 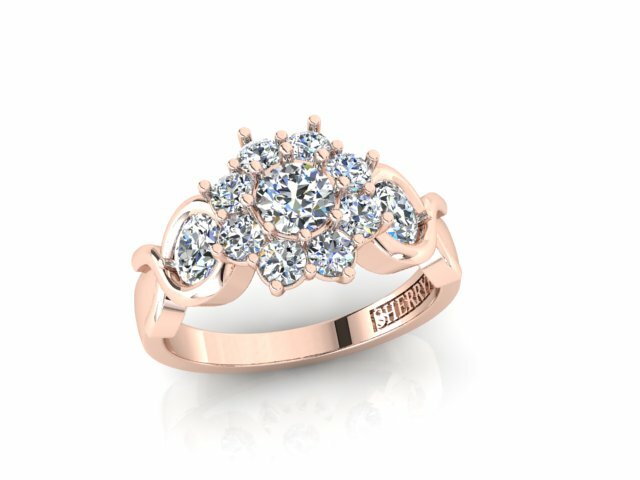 This unique rose gold diamond ribbon ring was commissioned as a bespoke remodel, by a very special lady. As you can guess, she has fought and won a battle with cancer. Having come through her ordeal, she got engaged. She contacted us to commission a very special ring, using diamonds from a previous item. We discussed different possibilities when she visited the studio. Between us, we came up with the idea that a design, which incorporated a symbolic ‘Awareness Ribbon’ pattern, would be very meaningful. Using the shape, in conjunction with red gold brought the pink ribbon theme to the fore. We used our customer’s own big 3 diamonds in the centre of the cluster and inside the loop of each ribbon, which gave a high impact sparkle to the shoulders. This helped to bring the emblem into focus. We designed the lower edge of the ring, so that the undercarriage of the cluster slanted inwards. This meant that any future ring that was to be worn with it, would tuck right up next to the first ring. This can sometimes be a problem with cluster heads, unless the issue is thought about during the design stage. Once the commission was completed, the lady and her fiancé returned to Sherry Jewellery, to have a bespoke wedding ring made. We used the same, 18ct rose gold alloy and created a seven stone diamond ring, which sat comfortably against the engagement ring. The frilly outline of the cluster was mirrored in the scalloped row of diamonds. We set the stones in the same style, with shared claws to secure the gems well, without obscuring the stones. The shanks of both rings were made identical, which unified the impact of a matching suite of engagement and wedding rings. I know that this bespoke Awareness Ribbon Ring is treasured and it is a firm reminder of our client’s fighting spirit and the support that she had from her partner, through her illness.